I2M Data acquisition system allows you to acquire several parameters. Recording trajectories and GPS speeds you can obtain laptimes, and as many split times as you like (accurate to 1/100s). You can also add the acquisition of RPM, rear wheel speed, gears in use, TPS, all without adding any auxiliary sensor.Otherwise, by adding sensors you can also record suspensions, front wheel speed, tire temperature, brake pressure, the value of lambda sensor or any other sensor signal up to a total of 6 analog channels, 2 speed and 1 RPM. Our acquisition system is composed by 2 distinct but joined elements: the multi input central unit Dasy6 (that contains the hardware needed) and Danas2 (PC software which allows the user to analyze data acquired with Dasy) The system is easily customizable for each pilot needs. If a pilot needs a plain version, he can use Dasy only with GPS data, however being able to understand where can improve his performances analyzing various G PS paths and splits of different laps. If a pilot wish to understand also how to improve he can simply add bike provided signals. If a pilot wants a more detailed analysis he can use the complete system adding auxiliary sensors. 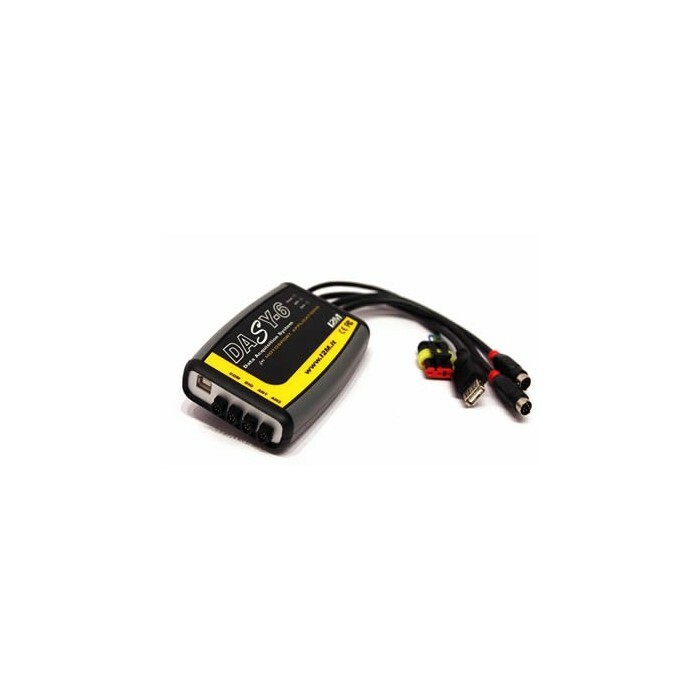 Dasy6 system is based on a compact central unit which receive power supply (12V) directly from the bike and for this reason can acquire data for a long time, limited only by the memory available for storage. On the front panel you can find all the connectors for the various inputs available. 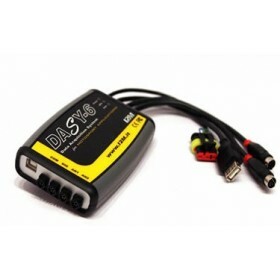 Each input has its own connector so it is simple to install and use Dasy. On the top of the box, 3 leds allow to monitor the working status of the system and of its GPS receiver. The system dasy 6 is based on a compact unit powered from the vehicle (12V) and therefore it can acquire data for a long time, oimited only by the memory available for storage (1GB). On the front panel you can find all the connectors for the various inputs available. The two connectors for the 6 analog channels provide also 5V output that can be used to power any external sensors such as linear potentiometers. The input for digital signals provides also a 12V output that canbe used to power any external speed sensors. On the top of the box, 3 leds allow to monitor the operating status of the system and of its GPS receiver. The data collected is stored on a flash memory. At the end of the session it will be possible to connect a PC directly to the system through dasy USB front plug in order to download data. If you don't have a PC you can download data and system configuration, even through a simple USB pen. Connect the key and the system will download the data without the need for any external command, at the end of the process, the LED will stop flashing and you can extract the memory. The data already present on the external memory will not beaffected thus making it possible to use this method of downloading with any key, even already partially used. The analisys of the collected data using 10Hz GPS technology becomes easy even for novice users thanks to Dasy. GPS tracking allows to instantly identify what parts of the track relate with each point of collected data moreover it gives valuable information about speed and trajectory. The furtheracquisition of RPM, throttle, rear wheel speed (without additional sensors) allow to give a concrete meaning to the collected data and convert this information directly to the driving information. The Dasy6 system is equipped with an output specially dedicated to miniLAP. You can then, with only one receiver, acquire digital and analog channels and real-time display your lap times, taking also advantage of a GPS stopwatch. The Dasy6 system, thanks to its output sync is able to control the activation of cameras such as the onboard video FlyCamOne2 obtaining video synchronous with the data collected. Videos can then be visualized and then analyzed using the video function of Danas2.